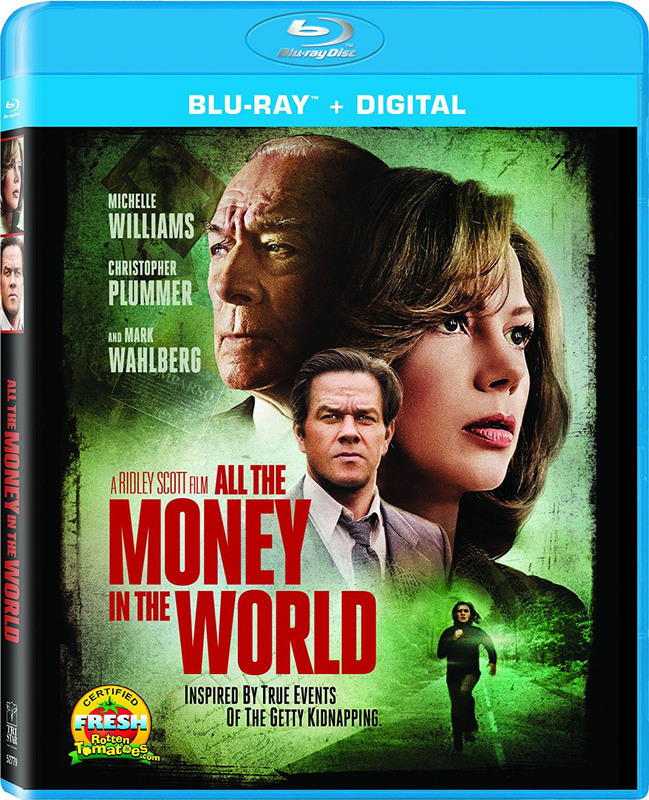 Academy Award-winning director Ridley Scott’s (“The Martian,” “Gladiator”) thrilling crime drama “All the Money in the World,” rolls out on Blu-ray and DVD Tuesday April 10, from Sony Pictures Home Entertainment. The film already is available on Digital. Academy Award nominees Michelle Williams (“Manchester by the Sea”), Christopher Plummer, who received an Oscar nomination for his supporting performance in the film) and Mark Wahlberg (“The Fighter,” “The Departed”) star in the dramatic story inspired by the 1973 kidnapping of billionaire oil tycoon J. Paul Getty’s grandson. When 16-year-old John Paul Getty III (Charlie Plummer, “Lean on Pete”) is kidnapped in Italy, his desperate and devoted mother Gail (Williams) tries to convince his wealthy grandfather (Plummer) to pay the ransom. When Getty Sr. refuses, Gail attempts to sway him as her son’s captors become increasingly volatile and brutal. With her son’s life in the balance, Gail and Getty’s advisor (Wahlberg) become unlikely allies in the race against time that ultimately reveals the true and lasting value of love over money. David Scarpa (“The Day the Earth Stood Still,” “The Last Castle”) wrote the screenplay, based on the book by John Pearson. The Oscar-nominated thriller includes bonus features, including eight deleted scenes and three featurettes inspired by the true events of this shocking tale and an inside look at the production, which included a last-minute reshoot with Christopher Plummer stepping in to replace Kevin Spacey, who had already shot all of his scenes as Getty when he got caught up in a sexual harassment scandal. “Recast, Reshot, Reclaimed” offers an inside look at the urgent recasting of the main character a little more than a month before the film’s theatrical release. Filmmaker Scott, cast and crew discuss the fast-paced and exciting way the epic movie was filmed—including a peek into the wardrobe, locations and score in “Ridley Scott: Crafting a Historical Thriller.” The “Hostages to Fortune: The Cast” featurette introduces viewers to the award-winning cast as they share the research they did to connect to their real-life characters. Another ripped-from-the headlines drama available on Blu-ray, DVD, and On Demand Tuesday April 10 is “Molly’s Game,” from writer-director Aaron Sorkin (“The Social Network,” “Moneyball”). The drama, from STXfilms and Universal Pictures Home Entertainment, tells the astounding true story of 26-year-old Molly Bloom, who through sheer nerve, wits, and acumen builds an empire and takes over the ultimate boys’ club—an exclusive floating high-stakes poker game. The film also is available on Digital. Nominated for an Academy Award for Best Adapted Screenplay, “Molly’s Game” comes with special bonus content that takes viewers deeper into the life of Bloom and a making of the film. Two-time Academy Award nominee, Jessica Chastain (“The Help,” “Zero Dark Thirty”), portrays the tenacious Molly Bloom, alongside co-stars Idris Elba (“Star Trek: Beyond,” “Beasts of No Nation”), Academy Award nominee Kevin Costner (“Hidden Figures,” “Man of Steel”), Michael Cera (“Arrested Development,” “Superbad”) Jeremy Strong (“The Big Short,” “Detroit”), Chris O’Dowd (“Bridesmaids, “Girls”) and Bill Camp (“The Night Of,” “Hostiles”). An Olympic-class skier, Bloom switches careers to become the organizer of one of the world’s most exclusive high-stakes poker games for a decade before becoming a target of the FBI. Her players included Hollywood royalty, sports stars, business titans and, unbeknownst to her, the Russian mob. Her only ally was criminal defense lawyer Charlie Jaffey (Elba), who learned that there was much more to Bloom than the tabloids revealed. The home entertainment edition includes a featurette titled “Building an Empire,” in which filmmaker Sorkin and star Chastain comment on Molly Bloom and her remarkable story. Jason Momoa (“Justice League,” “Conan the Barbarian”) stars in “Braven,” arriving on Blu-ray (plus Digital), DVD and Digital Tuesday April 10 from Lionsgate. This slick action-thriller is currently available On Demand. The action drama tells the tale of Joe Braven (Momoa) and his father who embark on a remote hunting trip that very quickly goes wrong. When Joe (Momoa) and his father (Stephen Lang) arrive at their remote hunting cabin, they’re hoping for a quiet weekend. What they find is a stash of heroin, hidden in the cabin by drug traffickers. When the criminals suddenly descend upon the cabin, Joe and his father must make a kill-or-be-killed stand for survival. “The Braven” Blu-ray and DVD include a special featurette called “The Braven’s Views,” and will be available for the suggested retail price (SRP) of $21.99 and $19.98, respectively. 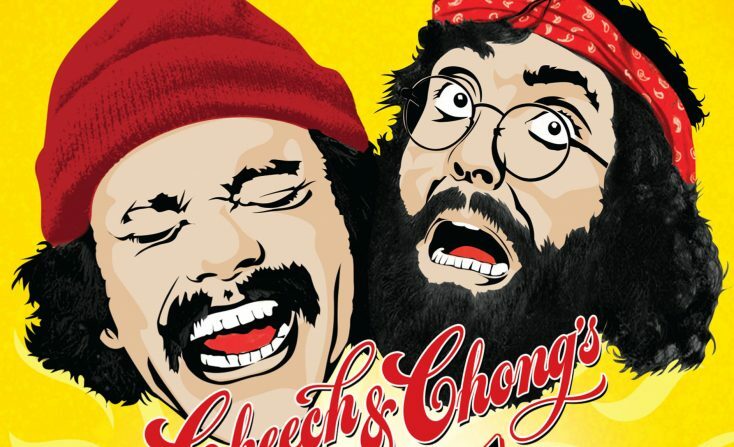 In 1978, the comedy team Cheech Marin and Tommy Chong made their feature film debut in the outrageously funny classic inspired by their popular comedy routines of the early ‘70s. Following massive success with more than 10 million comedy albums sold, four Grammy nominations and a win for Best Comedy Recording for “Los Cochinos,” Cheech and Chong took Hollywood by storm when “Up in Smoke” became a smash hit, establishing the pair as the reigning comedy duo of a new generation. Today, the film still has viewers rolling in the aisles and maintains surprising cultural relevance four decades after its original release. For those who’ve never seen the stoner comedy, here’s a brief synopsis: Cheech and Chong play wannabe musicians and stoners who unwittingly smuggle a van made of marijuana from Mexico to L.A. Their drug-laced humor keeps their spirits high as they unknowingly elude the police and meander their way to an outrageous finale at the Roxy Theatre in Hollywood where Cheech performs in a pink tutu and Chong plays drums in a red body suit with a Quaalude logo. The Blu-ray Combo Pack features a brand new short-form documentary entitled “How Pedro Met the Man: Up In Smoke at 40,” which chronicles the duo’s comedy history, as well as the origins and impact of the film itself. Capturing a complex and fascinating pop culture odyssey, the documentary incorporates new interviews with Cheech, Chong and producer/director Lou Adler along with archival footage. The Combo Pack is also loaded with previously released bonus material including deleted scenes, commentary, a music video and other extras. The “Up in Smoke” Deluxe Collector’s Edition is presented in a 12-inch by 12-inch package, and limited to 5,000 copies. The set pairs the Blu-ray with the original soundtrack on CD and vinyl LP as well as a 7-inch picture disc, oversized “Up in Smoke” rolling papers, a film poster, and booklet with new essays by both Cheech Marin and Tommy Chong, along with rare and unseen photos. In addition to the new version of “Up in Smoke,” the CD also features another previously unreleased version of the song from 1978 with an additional Spanish verse by Cheech. Academy Award nominee Tom Berenger (“Platoon”), Lance Heriksen, Meg Steedle and Danny Trejo star in the western “Gone are Days,” arriving on Blu-ray Combo Pack (plus DVD and Digital), DVD, and On Demand Tuesday April 10 from Lionsgate. An aging gunman sets out on an epic quest to perform one last good deed, hoping to save his soul. Taylon (Henriksen) emerges from his deathbed, puts on his spurs, and hits the trail in search of redemption. He crosses the desert to a gold-rush town, where he finds his estranged daughter working in a brothel. But to earn her freedom, he must confront the town’s vengeful sheriff (Berenger) — who has an old score to settle with Taylon. Including a never-before-seen behind-the-scenes featurette along with cast and crew interviews, the “Gone are the Days” Blu-ray and DVD will be available for the suggested retail price of $21.99 and $19.98, respectively. “My Friend Dahmer,” based on the acclaimed graphic novel about one of the most notorious serial killers ever, arrives on Blu-ray and DVD Tuesday April 10. Based on the acclaimed graphic novel about Jeffrey Dahmer, one of the most notorious serial killers ever. Its screenplay landed a spot on the coveted “Black List,” ranking it as one of the best un-produced screenplays (at the time) before being made into a movie. Released in theaters last year, the film played extensively on the festival circuit, premiering at the Tribeca Film Festival and going on to play at L.A. Film Festival, Deauville Film Festival, American Film Festival, and many others. The thriller features an all-star cast that includes Emmy nominee Anne Heche (“Donnie Brasco”), SAG Award winner Vincent Kartheiser (“Mad Men”), former Disney star Ross Lynch (“Austin & Ally”), Alex Wolff (“Patriot’s Day”) and Dallas Roberts (“3:10 To Yuma”). Dahmer murdered 17 men and boys in the Midwest between 1978 and 1991 before being captured and incarcerated. He would become one of America’s most infamous serial killers. “My Friend Dahmer” is the story before that story. The family adventure “Pinocchio” arrives on DVD, Digital, and On Demand Tuesday April 10 from Lionsgate. Awarded the Dove Seal of Approval, this animated adventure is a modern-day retelling of the timeless fable of a boy puppet and the lessons he learns from his misadventures. Carved by a lonely woodcutter longing for a real son, playful Pinocchio is eager to do good and become human — but he keeps getting distracted from his quest. Constantly captured by con men, creatures, and constables, he finds rescue courtesy of the helpful souls who recognize the wooden puppet’s kind heart. Featuring the voice talents of YouTube sensation and musical artist Johnny Orlando, Ambry Childers and Jon Heder, “Pinocchio” on DVD includes a never-before-seen featurette and will be available for the suggested retail price of $14.98. Tad and his lovable and zany friends are back in the all-new animated adventure “Tad the Lost Explorer and the Secret of King Midas,” is available Tuesday on DVD (with Digital copy) and on Digital Tuesday April 10. In this follow-up to the 2013 hit “Tad, The Lost Explorer,” Tad dreams of becoming an archeologist traveling the world, uncovering hidden secrets and lost treasure, but his job working construction keeps him daydreaming instead of exploring. The chance of a lifetime comes when he is invited to attend archaeologist Sara Lavrof’s presentation of her latest discovery—the papyrus that proves the existence of the Necklace of Midas, the legendary King who turned everything he touched into solid gold. When an evil billionaire forces Sara to help find the enchanted talisman, Tad must rescue the girl of his dreams on a trip around the world, in this new hilarious, action-packed adventure the whole family will love. A recipient of the Dove Seal of Approval, “Tad the Lost Explorer and the Secret of King Midas” and is rated PG. This week, Front Row Features is giving away a copy of one of last year’s most haunting dramas, “My Friend Dahmer,” on Blu-ray to one lucky reader. To enter the contest, simply email socalmovieeditor@aol.com by Tuesday April 17 for your chance to win. Good luck! Next PostPhotos: ‘All the Money in the World,’ ‘Molly’s Game,’ ‘Braven,’ More on Home Entertainment … Plus a Giveaway!!! ‘Pacific Rim Uprising,’ ‘Death of Stalin,’ ‘Agatha Christie,’ More on Home Entertainment … Plus a Giveaway!! !